Ignite Pond Lights are the perfect way to turn your already scenic and natural outdoor setting into a glowing, sculpture of warmth and elegance. These durable brass light fixtures are fully weather proof and transform any outdoor space into a dramatic light display. Ignite offers a fully customizable line of outdoor lighting supplies. Simply choose your light fixtures, wiring extensions, splitters, and transformers from our various options. Lighting adds the finishing touch to any pond or water feature project. This natural looking rock housing makes this light easy to hide in landscaping, ponds, streams or waterfalls. Place lights in and around your water feature to highlight key design elements, illuminate areas where fish congregate, or assure greater safety at night. 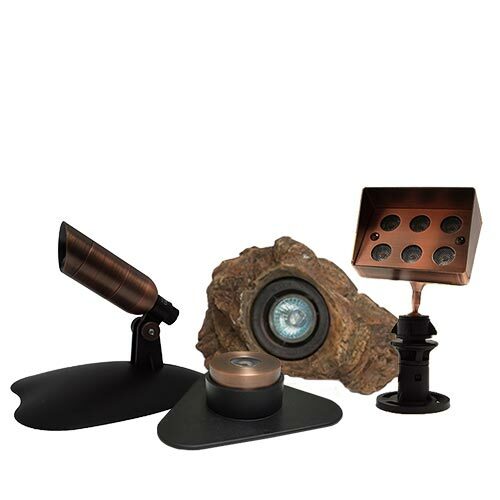 Ignite Pond and Landscape Bronze Lighting: Our classic ignite lighting line with an oil rubbed bronze finish. These lights have a built in T-connector for easily expanding lighting systems and are the perfect addition to any landscape. The quality finish looks great and will make your property look great. They are also fully submersible to use in pond or waterfalls. The whole product line is low voltage wiring. We have all the fixtures, stock, and parts your customers will need to design a elegant landscape or water feature.